WR Tre McBride: Small school prospect, big time prospect? WR Tre McBride, William and Mary, 6′ 210 lbs. Cons: Obviously coming from a smaller school, the receiver is quite raw in a lot of areas, including his route running. This isn’t to say that with NFL coaching he won’t perform, but the skills are not there yet. I thought he seemed stiff-hipped making cuts, but has the necessary burst to get away from most defenders in the open field. McBride lined up mostly in the slot, because he had some issues getting off the line of scrimmage. The wide out did get roughed up by physical corners, but has the power and strength to deal with that as evident with his run blocking. Pros: Despite the rawness, McBride is a good athlete adjusting well to the ball in the air, making some circus like catches, getting both feet down before going out-of-bounds. He attacks the pigskin, always trying to snare it at the highest point, and is quite dangerous while making the reception in stride. Although, he is not the biggest receiver, the former Tribe player looks great on bubble screens that take advantage of his strength and straight line speed (4.41 forty yard time) while using stiff-arms to create space. The wide out boxes out his coverage, fights for contested passes, and can take a hit while still holding onto the ball. McBride has soft hands, shows good burst in the open field, and sees the entire field well. His vision is also helpful when he is returning kicks. He follows his blockers well and uses a jump cut to get away from would-be tacklers. Unlike most college receivers, McBride is a natural run blocker which will give him more opportunities earlier on in his career. Overall thoughts: There is a lot to like with this rookie, but use patience for anyone drafting him. 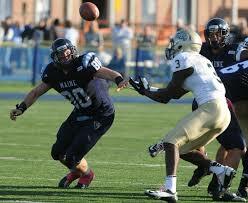 It will take him so time to adjust from William and Mary to the NFL. I would only draft him if I had a taxi squad or deep enough rosters to stash him for a year. His value will also be greatly affected by the team that drafts him. « RB Tyler Varga: Fullback, halfback or both?